1 June / This year’s Tartu city summer campaign takes Tartu in the form of fabulous pop-up festivals to Narva, Pärnu and Tallinn, where, in addition to various performances and awesome exhibitions, several prizes will be given out. 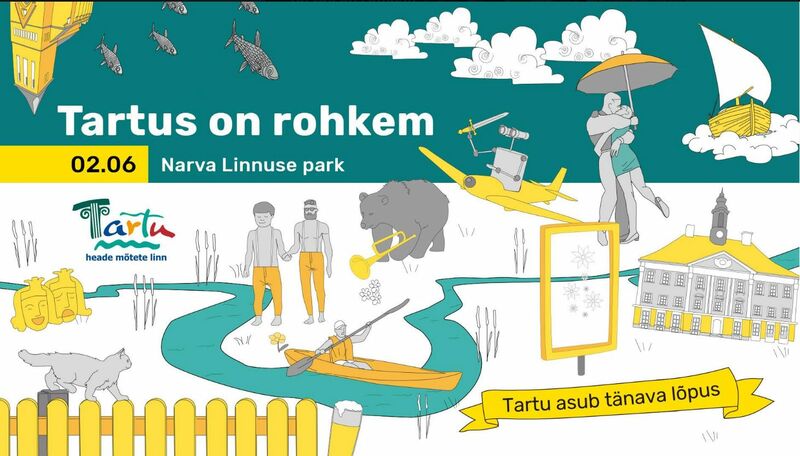 The pop-up festivals take place on 2 June from 1 PM to 4 PM in the Narva castle park, on 9 June from 12 PM to 3 PM in Pärnu at Martens Square and 16 June in Tallinn at Freedom Square. The aim of the campaign is to introduce the many recreational opportunities of Tartu and Tartu County to local tourists, and, at the same time, disprove the idea of Tartu being too far from these cities. In each city, the main prize is a holiday package in Tartu, whereto the winners can drive in a brand new BMW i3 with an economic electric engine. Several Tartu businesses have joined the campaign: museums and attractions, hotels, restaurants and cafes, as well as other businesses involved in the tourism sector, who, for their part, have contributed to the preparation of stands introducing Tartu’s opportunities as well as the prize funds. The exhibition created for the campaign, consisting of ten double-sided stands, will remain in each city for a week for the locals of the city to see. a tasty gift bag from Salvest. Accommodation, catering and activities for the whole campaign are provided by: Hektor Design Hostel, V Spa and V Spa Hotel, Cafe Pööre in the Atlantis building, Science Centre AHHAA, Upside Down House, Aura Centre, Ice Age Centre, Vudila Playland, Salvest, Tartu Market Hall and its vendors, Seto Line tours, the University of Tartu Museum, Vanemuine Theater, businesses along the Onion Route: Alatskivi Castle, Peipsimaa Visitor Centre, Gallery Voronja, Juhan Liiv Museum and Kadrina Manor, and several other partners. Contributing to the festival’s programme are associations that have received cultural support from the city of Tartu as well as Salvest, who, in addition to prize packages for the draw, also supports the performers with a small meal and presents the winner of the main prize with a tasty gift bag for the way. The campaign is organized by Tartu County Tourism Foundation in cooperation with Creative Union.